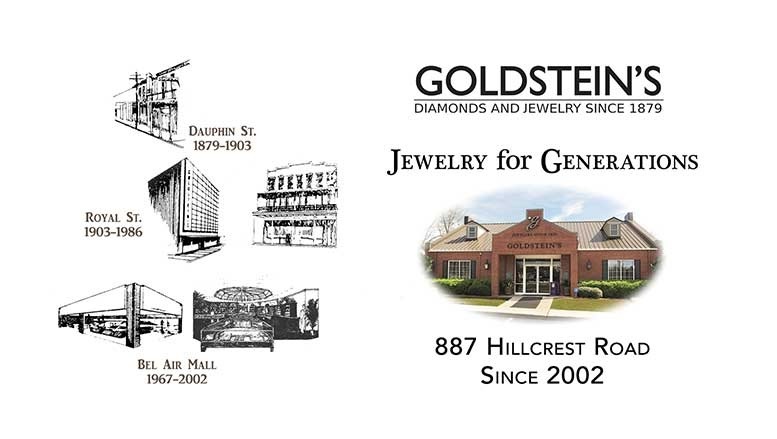 Goldstein's - Mobile's oldest jewelry store, and an Alabama Centennial Retailer - was founded in 1879 by Julius Goldstein and has been owned and operated by the Richard Frank family since 1956. Though our location has changed over the years, our commitment to value and service has not. We are extremely proud of our 135 plus-year history, but our focus is on our present and future - built on the traditions of the past. Our goal is to amaze you with our jewelry and service and friendliness. You will always be proud to say, "It came from Goldstein's!" We are proud members of the American Gem Society (AGS), the Independent Jewelers Organization (IJO) and the Retail Jewelers Organization (RJO), as well as Jewelers of America, Jewelers Security Alliance and the Jewelers Vigilance Committee. As professionals, we believe in education and community involvement. Memberships in the Diamond Council of America, The Alabama Retail Association and the Mobile Area Chamber of Commerce ensure we stay "in the know!" Since moving to Hillcrest Road in 2002, Goldstein's has grown and prospered. We have become the area's premier source of quality diamonds, and Mobile's exclusive Hearts On Fire, Coast Diamond, A. Jaffe, True Romance and Vahan Jewelry dealers. We also represent Galatea, Denny Wong, Ed Levin and many others. We are partners with the finest engagement and bridal designers in the US, with an extensive selection of settings and diamonds for those settings. We are Mobile's Engagement Ring store, carrying many fine designer rings to make sure each ring fits every individual relationship! Want something made just for you? We work with you to customize every beautiful piece we sell. In addition to all the above, we are very proud of our custom design department where we can make what your heart desires. Expert jewelry repairs are always done in the store--we will amaze you with our work! Shop Cross necklaces and more at http://bit.ly/gldstcrossjwlry .